Pardon my ignorance, I thought the soft crabs were a particular kind of specie…They’re apparently not. When I found out that they’re basically regular crabs that molted their hard shell, I felt a little bad to eat them. Poor little crab without his house…but I already bought them, so I had no other option that cook them…so the little homeless crab had to end up in my plate. I found a very useful site explaining how to clean them on ChefsLine. Radicchio has two of my favorite features, colorful and bitter, which combined with fennel makes a very harmonious combination. The sweetness of the grilled fennel stands out beautifully, and complement the slight acidity of the cream of chick peas due to lemon juice and capers. So what about the crab?? I have been talking about everything except about our naked crab..and this recipe is not about fennel, nor radicchio BUT only about the crab! This crab is such a treat, every bite is meaty and delicate, it is baked so not as crunchy as you would get it it was fried, but definitely healthier. So delicious! the topping makes it flavorful with a little sesame note and blends to perfection with the chick pea cream. 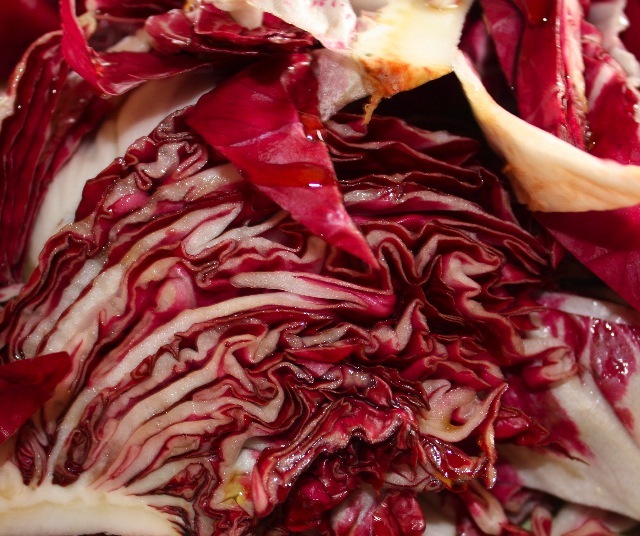 Grill radicchio and fennel on a grill pan, then place on a large bowl, add other ingredients and set aside. In a mixing bowl, mix all ingredients together except for the crab (of course). Top each crab with the breadcrumb/almond mixture, drizzle each crab with a little olive oil, and back in the oven at 400F until the top is golden brown and the crab is cooked. Mix all ingredients except capers and yogurt in a blender. Remove from blender and add capers and yogurt. Mix well and set aside. Serve with some warm salad in the middle of the plate, two soft shell crabs on top and spoon cream of chick pea on the side. This entry was posted by silvia on July 5, 2010 at 5:20 am, and is filed under Fish/Seafood. Follow any responses to this post through RSS 2.0.You can leave a response or trackback from your own site. Gosh Silvia – your dish presentations are so beautiful. Everything you make is edible works of art! I’d like to try the cream of chick peas and capers on the side of other dishes, as well. Thanks for the crab lesson, I didn’t know that either Silvia. This dish looks like it came right off the restaurant menu. 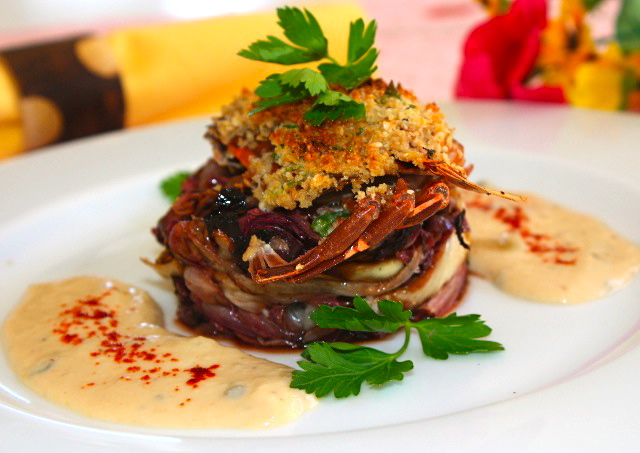 This looks wonderful with stacking fennel-radicchio salad and creamy chickpea sauce. Irresistible! Oh. I didn’t know as well! Thanks for telling us all. I’m laughing, Silvia, because when I was pregnant with my last, I CRAVED soft shelled crabs. Made my husband go to this one restaurant (where they made delicious ones) and get take-out (not something they ordinarily did) for me 3 or 4 times a week! I love this dish. The addition of almond flour is genius! This looks stunning! I love soft shelled crab, but I also feel a bit bad when I eat them. They just look so cute! But I know I wouldn’t struggle to eat one if you prepared it. These look amazing! le crabe a perdu sa maison et sa raison; enfin malgré toute ma sympathie pour ce puavre crabe je dois dire qu’il est rudement appétissant! Great recipe, and so beautifully presented! I am not a big fan of soft shell crabs but I would give this a go. Wonderful recipe for the cream of chick peas and capers. Hahaha…. what a funny name for this! Frankly, the recipes sound fabulous. You’re making hungry. Thank you so much for sharing. Is it possible to drop you a visit when I’m visiting America in the future? =o) hehe…. Hope you’re having a great day! GORGEOUS DISH! We’re crazy about soft-shell crabs. I need to surprise my husband with this recipe! No wonder you can only get soft-shell crabs a certain time of year! That makes perfect sense. This looks so good by the way. Nothing beats a good soft shell crab dinner-I always love it! I like soft shell crab but it seems that there are limited ways to cook them – they usually are served deep-fried. Now…yours look uniquely different. Silvia…at first the title made me think you could write a children’s story book about the poor little crab without his home. Alright, just an initial child-like impression. Soft shell crab is often used in Sushi and I’ve been honestly avoiding it since my first bite. It probably had not been prepared the way you describe it. I’ll have to maybe give it another chance. I totally know what you mean! I feel sad for the little crab too … I guess I’m a bad person because that doesn’t stop me from gobbling him up like the Big Bad Wolf. Beautiful dish! Silvia, don’t feel too bad for homeless crabs! Now I feel bad that I didn’t feel bad for them. It’s getting more confusing haha. Love your presentation so much! I like the fennel too. It goes well with seafood! I love what you’ve done with the homeless crab. I love them but have only ever eaten them in Japanese-inspired dishes. As usual, your flavor pairings are fabulous!